Portadown lost out by 1-0 last weekend at The Oval in the Danske Bank Premiership. 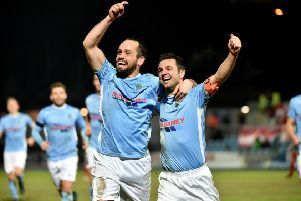 The defeat to Glentoran was settled by Marcus Kane’s first-half finish. Portadown players return to the halfway line as Glentoran celebrate the only goal at The Oval on Saturday. Pic by PressEye Ltd.